~OgreTile desctructor. Calls the static method destroyAllGraphic() to ensure Ogre instances get deleted by the right thread. The graphicDispatcher set by create() must stay valid until after ogre3d shutdown. initialise calls createMeshGraphic() on graphic thread. Not called by constructor because getSharedThisPtr() isn't yet available. createMeshGraphic allocates and initialises an Ogre::Mesh where the vertices and indices will get saved to later. m_shouldBeVisible saves if tile should get rendered. saves if crack closing submesh should get rendered. 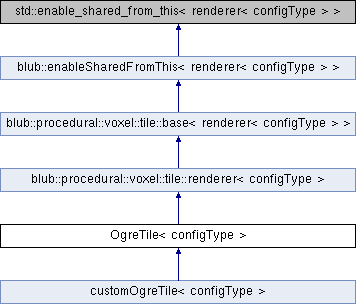 The OgreTile class converts the resulting vertices and indices of the voxel-terrain to the Ogre Hardwarebuffer. The class handles setVisible() when a tile gets cutted because it's too near or too far or a cracks has to get closed. The results of the transvoxel-algorithm for closing the cracks between the lod-tiles get set to submeshes. Every tile contains a Ogre::Mesh, a Ogre::Entity and a Ogre::SceneNode. For more information on how to use ogre3d see http://www.ogre3d.org/docs/manual/ and http://www.ogre3d.org/docs/api/1.9/ . customVertexInformation.cpp, mesh.cpp, noise.cpp, and primitives.cpp. graphicDispatcher Only the thread that initialised the Ogre::Root may call Ogre methods. The graphicDispatcher must get called on every frame by the ogre thread. Methods that end with Graphic have to get called by this dispatcher. returns an instance. Never nullptr. destroyAllGraphic gets called by destructor - ensures that ogre3d classes get destroyed by the right thread. scene Must not be nullptr. mesh_ Must not be nullptr. entity_ Must not be nullptr. node_ Must not be nullptr. aabb Used for the meshes aabb and the center gets used as the position for the Ogre::SceneNode. setVisible sets if a tile should get rendered. All lod-submeshes must not be rendered either. Reimplemented from blub::procedural::voxel::tile::renderer< configType >. setVisibleGraphic sets the whole tile to visible or invisible. Gets called when tile cutted because too near or too far away. setVisibleLodGraphic sets a subentity-visibility. Gets called if the neighbour tile has a different LOD. To close the occuring cracks this method gets called.